Habitat: Desert, Upland. This wildflower grows in desert foothills, canyons, grasslands, and upland areas. Description: The flowers are alternately arranged and spaced so that they mostly do not overlap each other on tall, very slender, densely stipitate-glandular flower spikes with inconspicuous floral bracts. The flowers first begin to open at the base of the flower spikes. The individual flowers are tubular and have a 2-lobed upper lip, a 3-lobed lower lip, and a hairy, white throat. The flowers are followed by dry seed capsules that do not overlap each other on the spikes. The leaves are green, hairy above and below, sparsely stipitate-glandular, opposite, sessile, oblong, and either pinnately lobed or deeply pinnately toothed with 3 to 5 point-tipped teeth or lobes on each side. The stems are green, hairy, stipitate-glandular, slender, erect, and branched. 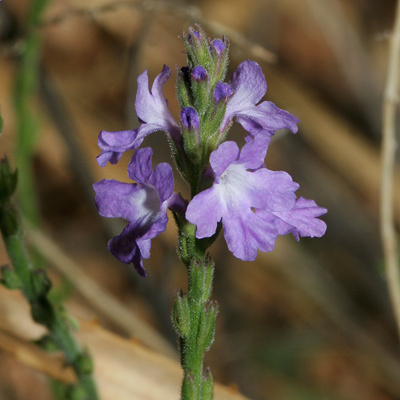 The very similar Chihuahuan Vervain (Verbena pinetorum) does not have glandular flower spikes or stems. 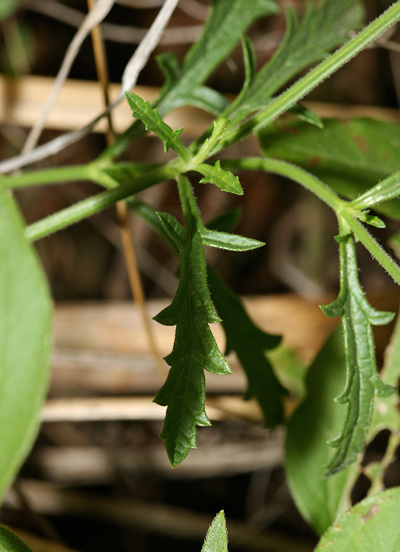 Carolina Vervain (V. carolina) has leaves edged with numerous, smaller teeth. 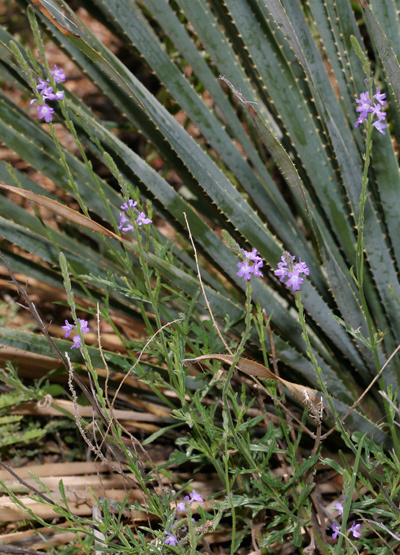 Pinleaf Vervain (V. perennis) has much narrower, linear leaves. Fanleaf Vervain (V. plicata) has much broader leaves. 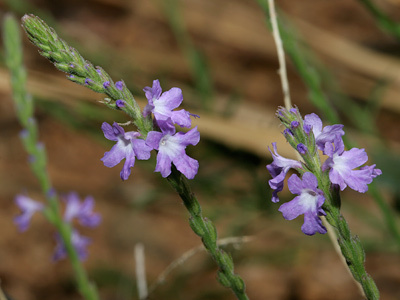 Gulf Vervain (V. xutha) is a much larger plant with more tightly packed flower spikes.